September 14th, 11:30 a.m. - 1:00 p.m.
As the spouse of well-known breast cancer survivor, Liz Hurley, Dave’s presentation will be on “Walking a Mile in His Shoes” as he shares his story of being there for his wife’s cancer journey. Throughout his career, Dave Hargrove has demonstrated leadership in communications and relationship building. He has a long time fascination with using technology to enhance personal and business productivity while bringing people closer together. Dave serves as Regional Director of Government and External Affairs for AT&T Alabama, based in Huntsville. His responsibilities include government, community and media relations as well as customer service and marketing support in the sixteen northernmost counties of the state. AT&T helps millions around the globe connect with entertainment, mobile, high speed internet, cloud, and voice services and is one of the most honored companies in the world. Prior to joining AT&T, Dave managed operations for the digital media production facility at Intergraph, a computer graphics company where he coached a creative team that developed marketing, training, and business presentations. Before Intergraph - he was a television journalist and led news and programming operations for several radio stations in Alabama. Dave is involved with a variety of North Alabama community organizations focused on leadership, community development, education, and financial services. 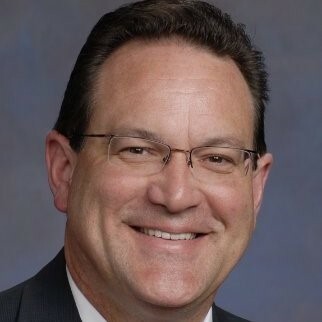 He currently chairs the Board of Directors for Redstone Federal Credit Union, the largest credit union in Alabama and among the largest in the country. He also leads Launch 2035, a regional visioning collaboration between business leaders in Madison, Morgan and Limestone counties. Dave has also chaired several other prominent and influential organizations, including the Huntsville/Madison County Chamber of Commerce, Leadership Huntsville/Madison County, the Huntsville Committee of 100, United Way of Madison County, The Schools Foundation of Madison County and the Rotary Club of Greater Huntsville. He is an active alumnus of Leadership Alabama and a graduate of Leadership programs in Huntsville/Madison County, Decatur/Morgan County and Cullman County. Born in Decatur, Alabama, Dave received his Bachelor of Arts degree from the University of Alabama in Tuscaloosa with a concentration in media communications. He is married to Liz Hurley Hargrove, veteran news anchor and reporter for WAFF-TV. They are proud parents of son Jordan, daughter Olivia and a retriever-mix shelter rescue named Humphrey.